First established as an adobe mission in 1851, the oldest church along New Mexico's southern border was dedicated as a minor basilica over the weekend. The special Mass took place on the Mesilla Plaza, just in front of the church entrance, where 1,500 chairs were set out to accommodate those attending. Most seats were occupied. The Rev. Richard Catanach, rector of the Basilica of San Albino, said it will take time for the church to adapt to its new role, perhaps five to 10 years. "It's really the beginning," he said. "We'll grow into what it means to be a basilica." Matthew Garcia of Mesilla, 16, has been an altar boy at San Albino for the past eight years. He said he thinks the new status will boost the already-popular church's prominence. "It's pretty much the center of the town," he said. "You've got to be here early just to get a seat sometimes." Oscar Frietze, a Mesilla resident and Doña Ana County magistrate judge, said it's not easy to articulate what the church's new standing means to residents. Monsignor Robert Getz, who led an effort seeking basilica status for the 150-year-old church, talked about how the idea originated. "About two and a half years ago, ... I began to pray with a sadness and a heavy heart," he said. 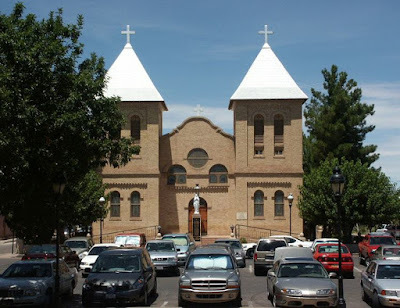 "What it was was I began to realize these generations of faith here in Mesilla were and would be taken over by the developers, the commercial district, the shops, the vendors. The Lord kind of gave me this inspiration that there must be something more. Then it came in the idea of a church of distinction as a basilica." Among the faithful Saturday was Margie Ibarra of Las Cruces. She said her children were baptized at San Albino. "It's an honor to the church, and the people from Mesilla really appreciate it," she said, speaking of the church's new status. Ram'rez told the crowd the basilica is "more than a museum," and it holds much spiritual significance. "We hope that people who come here won't just come to say: "Oh, how cute. Oh, how pretty,'" he said. "No, ... we come here to pray. This is a place of God. This is a source of grace, a place of healing and encouragement." 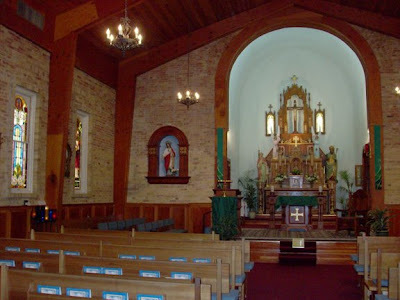 The state's second structure to bear the honorific (after Santa Fe's Cathedral of St Francis), the valley church is the nation's 61st to receive the distinction since St Adalbert's in Buffalo first nabbed it in 1907. The designation given by the Holy See for reasons of their historic and cultural import, minor basilicas are especially expected to serve as key centers of prayer and pilgrimage both in their immediate communities and beyond. 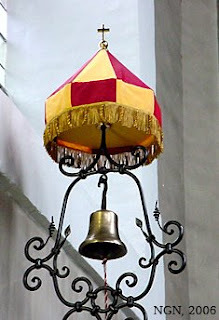 Specially linked to the Pope as an extension of Rome's major or "papal" basilicas in the life of the local churches around the world, minor basilicas -- their status marked out by the traditional ombrellino (canopy) and tintinabulum (bell) -- rank behind cathedrals and the Eternal City's four chief temples: St Peter's, St Paul's Outside the Walls, St Mary Major and its cathedral of St John Lateran, long given pride of place as the "mother and head" of them all. SVILUPPO: As part of the reconfiguration of Buffalo's churches that's seen 77 of the western New York diocese's parishes shut their doors, St Adalbert's is slated for closure (possibly, it's been said, to be converted into a mosque). Appealed to Rome, the decision was upheld last February by the Apostolic Signatura -- the church's highest court -- but remains in the air due to a technicality in the law.